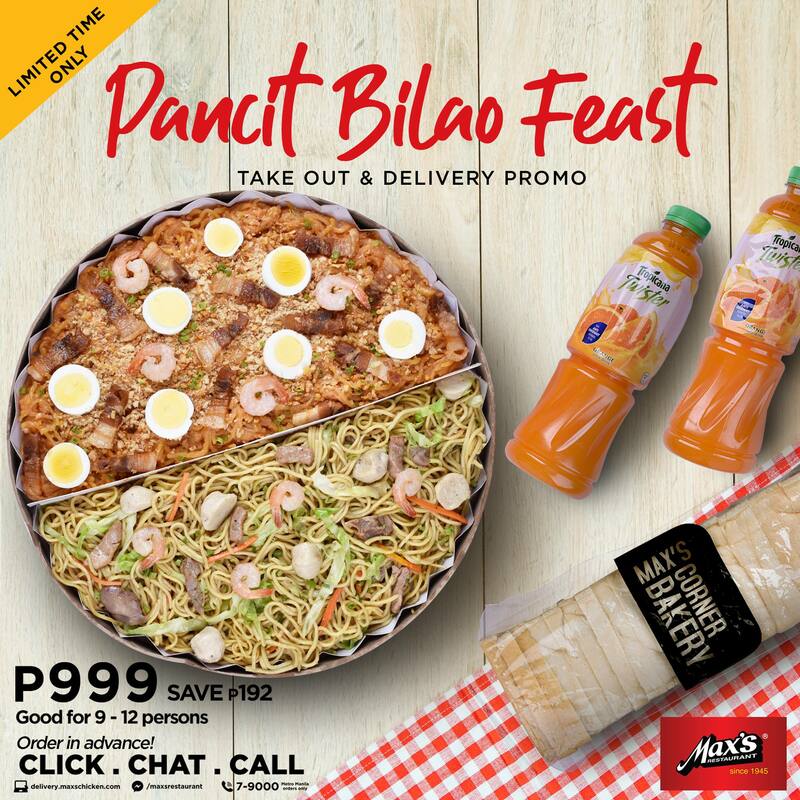 Enjoy oodles of tasty noodles with Max’s Pancit Bilao Feast! Whatever the event or occasion is, nothing gets Pinoy foodies more excited than a bilao of pancit! As much as we love rice, pancit is the perfect party food. It is is fully loaded with meat, veggies, and carbs that is perfect meal for for pot-luck, large parties and get-together. And if you are planning to feed a pack of food-lovers, then Max’s Pancit Bilao Feast is sure to take any palate on a filling and flavorful gastronomic adventure. Experience real food on the go for just PHP999.00. This irresistible offer is already good for 9-12 persons. The bundle includes one (1) Pancit Bilao Choice of Pancit Bihon, Pancit Canton or Pancit Luglug and it comes with one (1) Max’s Corner Bakery Tasty (800g) and two (2) 1 Litter of Tropicana. Save Php192 and enjoy good food when you order the bundle for Take-out or Delivery. The promo is valid in Metro Manila stores and available for limited time only. You can place your order online by clicking HERE or calling their hotline 7-900 (for Metro Manila stores only). For more details and updates, please visit their official Facebook Page.